I made this card to show to my scouts an alternative to making spooky halloween things. I got the purple card and the sequins on the card, not to mention the PVA glue, from the Big Box of Spooky Crafts. I picked out three black star sequins, three metallic orange butterflies sequins, one black circle sequin, two metallic orange three dimensional flower sequins and four metallic green sequins. I then arranged the sequins into a pattern I liked and glued them in place. If you look at the picture you will notice that I stuck one of the flowers onto the black circle, I think this gave a nice effect. Also the purple worked well with the orange and green metallic sequins. One of my friends has a birthday that happens to fall exactly on Halloween the 31st of October. We could not make it to his birthday party so I made him this card instead. I used one card blank and enverlope from The Works in Cheltenham and a set of coloured fine liners from WH Smiths. I then drew on the card, first off the spooky writing – the HAPPY in red as it was supposed to be dripping blood and the BIRTHDAY in gloopy green writing. As you can see from the photos I did this all free hand and as a result had to break up the word birthday over two lines – I would advise that you measure out where you are going to put the letters before hand. 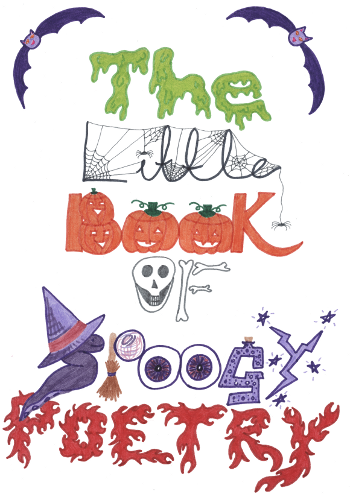 I then drew things in around the writing that I thought suitably halloween scary like the huanted castle upon a rocky jagged hill, the moon peaking out of the clouds and the silohett of the witch on her broom stick! Along the bottom of the card I drew a cualdren with fumes drifting up to form a skeleton – I wasn’t very happy with the skeleton and if I was to redo the card I would dig out the book Greys Anatomy so that I could copy the skeleton rather than trying to work it out as I drew it. There is also an eyeball complete with optive nerve trailing behind it. I also added a ghost in amoungst the writting and a amphora of poison. Anywhere else on the card that I thought needed something I added little flying bats! I then coloured it all in – like the posion and the castle but I left the writing uncoloured as i felt it would look better. This pipe cleaner spider was really easy to make – I used a black pompom, four black fluffy pipe cleaners, two medium goggly eyes and a pair of scissors. I simply cut each pipe cleaner in half and then twisted them around the black pompom which became the spiders body – the pipe cleaners its eight legs. I then stuck on the eyes which where self adhesive. This green stick monster or alien depending on what it is doing was deseptively easy to make. I used one medium green pom pom, one green lolly stick, one large goggly eye, two green matalic leaf sequines, one white foam shape, a pair of scissors and white PVA craft glue. I started off by cutting a slit into the green pompom squeezing in some glue and sticking the green lolly stick into the glue filled whole. I then squeeshed the slit closed around the lolly stick and waited for the glue to dry. I then stuck on the large goggly eye. I then cut two slits in the green pompom either side of the eye. I then squeezed glue into the slites and poked the wide rounded ends of the green leaf sequines into the wholes as ears. Whilst the ears were drying I took the white foam sheet and cut out a zigzag line to make the teeth – I would suggest that you draw on the shape you want before cutting though I didn’t. I then glued the teeth in place.